Since the New York Times published an article about President Obama’s assassination-by-drone program, several writers, including Glenn Greenwald (here, here, here, here, and here), Tom Engelhardt (here), and Kevin Gosztola (here, here, here, here  here and here) have posted articles condemning it. EDIT: I added links to a series of excellent articles by Kevin Gosztola that I inadvertently omitted from my original post. Thanks to Elliott for the reminder below in the comments. 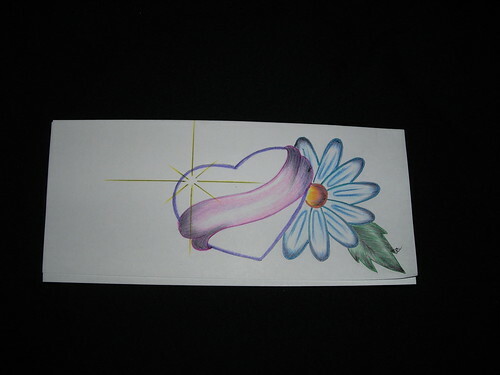 Heart and Flower. Jail art by Crane-Station on Flickr. Ink, magazine ink and colored pencil. Frog Gravy is a nonfiction account of incarceration in Kentucky in 2008 and 2009, first in jails and then in prison. This is the beginning of a series on the legal case. Everything here is in the public domain. Names have not been changed in the legal case. The arresting officer in my case was Deputy Eddie McGuire of McCracken County Sheriff. Since I was not allowed to be present at the Grand Jury in my own case, I do not know the identity of the prosecutor. Frog Gravy posts are gathered in one place at froggravy.wordpress.com. The Grand Jury is the entity that can indict a defendant on criminal charges. In state court, the prosecutor shows up with a written indictment for the Grand Jury to sign. The arresting officer testifies to whatever is necessary to get an indictment. The defendant is not allowed to be present, nor is the defendant’s counsel. In my case, the indictment that ultimately led to an eight-year sentence, took just six minutes. 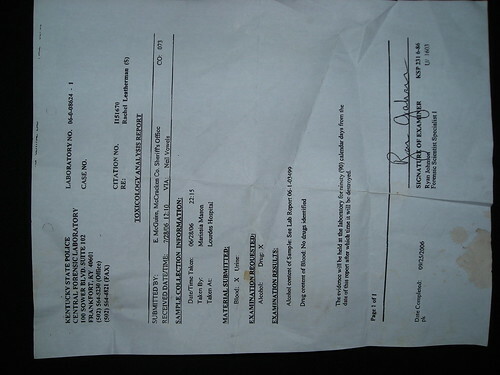 I was indicted for DUI, possession of a rock of crack cocaine weighing .144 grams, and tampering with physical evidence. The assertion was, that after a one-hour and twenty minute roadside search of my vehicle and person revealed no illegal drugs, residue or paraphernalia, I somehow produced and placed the rock into the back seat of the police cruiser, as I was transported to the hospital for a blood draw. As you can see, four days prior to the Grand Jury meeting where Deputy Eddie McGuire testified that I was smelling of alcohol and stumbling, the crime lab faxed a copy of the exculpatory result to the Commonwealth prosecutor. Issue: McGuire’s false testimony at the grand jury about alcohol intoxication. No reference to Mrs. Leatherman being intoxicated on alcohol. 2. McGuire’s Uniform Offense Report. 3. Preliminary hearing on July 6, 2006. Q:	[by Will Kautz]And so – and so when you approached my client, did you arrest her on a DUI? Is that what happened? Q:	Relating to alcohol or drugs? A:	Drugs. She had a beer in the car, but we performed a PBT (portable breath test), and she had – she had very little alcohol. 4. Grand Jury on July 28, 2006. Q:	[Examiner] We don’t have the blood results back? A:	[McGuire] I don’t believe so. Blood or lab, yeah. Q:	Did she admit to drinking at all? A:	No, I don’t believe she did. You can smell alcoholic beverages on a person. Q:	So you could smell it on her? I immediately noticed she had some – she had very glassy eyes, very unsteady on her feet, noticed she had her pants unbuttoned and unzipped, just acting very erratically. I asked her why she had her pants unzipped. She just said that it was more comfortable that way. 5. 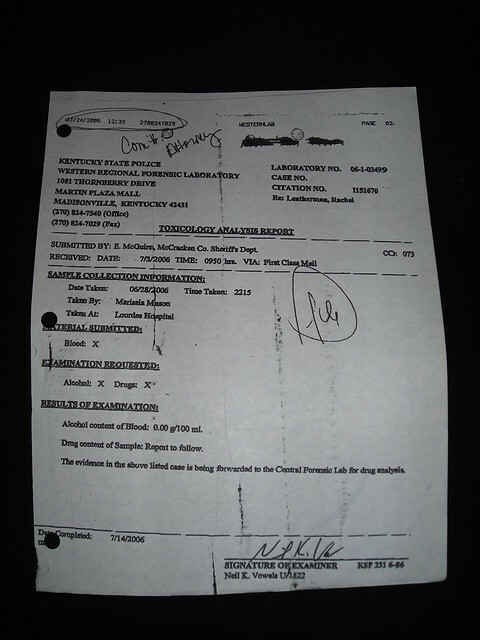 The Kentucky State Crime Laboratory Report of the blood-alcohol analysis of Mrs. Leatherman’s blood sample performed by Neill K. Vowells. 6. Suppression Hearing on November 27, 2006. Q:	[Will Kautz] Okay. So pretty much, it’s your practice if considering charging DUI to document all of those things that would be consistent with alcohol or drug impairment? Q:	— and the blood – not bloodshot, but glassy eyes? Q:	[by Will Kautz] When you asked her to exit the vehicle, she had no problem doing that? A:	[by McGuire] Not that I recall. Q:	And I know there’s nothing on your citation about her being unsteady on her feet, or anything like that? A:	No, I don’t believe so. Q:	The only manifestation, I guess, of being under the influence that I’ve heard at this point is something about glassy eyes. A:	The glassy eyes, and then I believe I testified in the preliminary hearing she was just very – just very nervous. As far as once you observe people, you can tell that they’re nervous, and she appeared very nervous. Q:	And it’s true that very often people who have done little or nothing wrong are nervous when they are pulled over by police officers? A:	Sure. That’s a possibility, yes. Q:	So pretty much what you’re talking about is glassiness to her eyes? Q:	Okay. And no inappropriate driving other than the turn signal? A:	Just the HGN, because she told me that she had had a back surgery and I think ankle surgery – back surgery and she had a bad ankle. note: I performed, and passed, four roadside portable breathalyzer (PBT) tests. Q:	Now, and this – I’m going to ask the judge at his leisure probably to look at the videotape at least up to the point of arrest. Q:	Would you agree with me that she was – appeared to be steady on her feet? A:	For the most part, yes, sir. I didn’t notice that she was unsteady, or I would have documented it. Perhaps you can better understand why Grand Juries always return indictments. My Grand Jury was led to believe that I was stumbling drunk and driving. My case is only one example of the many indictments returned in this country each and every day. The bookends framing Grand Jury perjury in my case are the under-oath testimony of Deputy McGuire at the preliminary hearing before and the suppression hearing after, the Grand Jury meeting. As it stands now, the Grand Jury process is a joke. It is anything but a venue for truth. Under-oath testimony means nothing. The system is abusive to the very citizens who serve on Grand Juries. 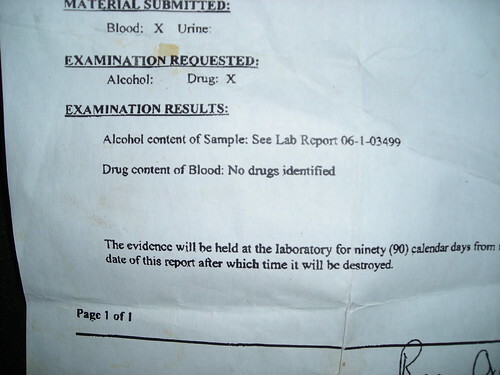 Also, my blood test results for drugs? “No drugs identified.” Picture coming with update. Sorry about that rotation on the first one.